Kirovsk, Lugansk People’s Republic – On May 8, a group of 11 internationalist visitors along with the leader of the Lugansk Communists received a tour at the front lines of battle from Prizrak (Ghost Brigade) Deputy Commander Alexey Markov (Dobriy). Afterward, we had the opportunity to meet with and ask questions of Commander Pyotr Biryukov (Arkadich). One of the things I asked about was the legacy of Commander Alexei Mozgovoi, for the Ghosts and for Donbass, a year after his death. 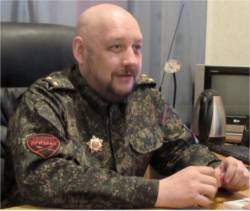 Mozgovoi and four of his comrades were assassinated in a roadside attack on May 23, 2015. Arkadich responded: “We are here! That is the main answer. Mozgovoi is still alive for us and we have not forgotten him. It was our choice to join Prizrak in 2014. A fascist group from Ukraine took credit for Mozgovoi’s assassination. However, there was intense speculation that conservative forces in the government of the Lugansk People’s Republic may have been responsible. Other prominent left-leaning militia leaders have also been slain under mysterious circumstances. Arkadich addressed this issue: “Many people wanted to make a sensation about Mozgovoi [after his death] — Internet warriors — talking about how we should go to Lugansk to clean house. There were many accusations, but we need a solid basis to take action. We don’t want to be clowns or make accusations that would aid the enemy. Dobri added: “In 1914, when World War I began, no one knew that world empires would fall. We can’t say what will happen in the coming years, but we are not only fighting in a war, but gaining very important experience which may one day be valuable for everyone. As communists, we have to be ready for any kind of world situation.